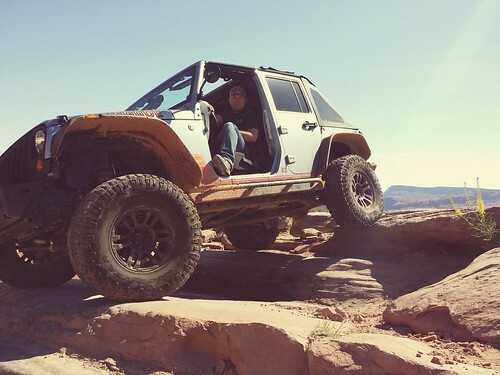 Me, the author, in Moab 2014. Vegans are never about the status quo. And, come to think of it, the offroad community really isn’t either. We both deal with social stereotypes and pressures, fight for policy changes, and form tight knit groups among us. While one explains where we get our protein, the other explains how they climbed that rock face with open diffs and an engaged sway bar. The idea for this blog was born from a Facebook comment made by a friend. It went something like this “Scott, you magnificent beast.” Apparently he had never heard of a vegan guy building Jeeps, shooting guns, and offroading. I guess vegans have some work to do on their image, and I want to fix that. My goal is to shed these stereotypes, and bridge the gap between two groups that seem on the surface to have nothing in common – when in reality they are very similar. 31-year-vegetarian & Jeep Wrangler owner here, too! Much love! Woot woot!!!! Maybe the offroad vegans aren’t such a small segment of society after all! I saw your jeeps in Klamath Falls on Saturday. Are you touring Southern Oregon and are you here for any length of time? Hey Gerry! Thanks for reaching out. We hit the Rubicon trail, and just got back yesterday. Had an amazing time, even dragged my new offroad trailer over the whole trail (with minimal damage). Thanks for checking out the blog! Love the die-cut on the back of the trailer! Any chance they’re for sale? Hey man, thanks! I can talk to my buddy and get a price for you. Where are you located? I can get it to you for $18 shipped (as long as you are in the US). Email me at offroadvegan@gmail.com and I can put you in touch with my friend. Yes!!! I live on the mountain. Gun-totin’ vegans are NOT to be messed with!!! My husband wheeled with you this last weekend – Gary Kipp. He told me about you because I’m vegetarian and mostly vegan and never know what to take when we go out for the day or camping. I love this site – thanks!! Hey Lori! Thanks for reaching out. And Gary never mentioned that! On the trip last week I had some Louisville Vegan jerky, Natural Balance “cheeze its,” New burgers from Sweet Earth (Teriyaki flavor), and a few staples like veganaise. You should come wheeling next time and I’ll bring a bunch of goodies. Have you tried Beyond Meat? He mentioned that you were eating some jerky, but he didn’t know what it was. I have tried Beyond Meat crumbles and I like them (even Gary will eat it) but I haven’t tried the burgers yet. Hopefully we’ll get to wheel together soon! great write up on the ace bumper, helped me allot! Being a Vegan I sure you had enough nuts and berries before you tightened up that Nut on the Wheel Carrier, I don`t think 20 foot pounds will even crush the lock washer and please don`t tell me you used that little 1/4 drive to tighten it up with. All joking aside you did a great job and keep up the good work! Ha! You know me, gravel and granola! Glad the writeup helped man, and thanks for stopping by!!! Finally, finally, finally I find a place where I can fit in. I enjoy the off road, guns, and animal rights. This page is one of the most reasonable approach to veganism I have seen out there. Great page and glad I found it. Thanks Greg!! Welcome! Thanks for your kind words. I also started the Vegan Gun Club, look for us on Facebook and join!